HUGE thanks to Grayjohn who spotted my huge error. Not a billion obviously but got by a sleeping me. That’s the award to a former Guantanamo prisoner paid by the Brit taxpayer and there will be more. Oh boy there will for sure. Why? Because it’s charged that Brit agents turned them over to our CIA for torture. Not only that, the Brits in some cases provided the nasty torture loving Americans the questions to ask their prisoners. Brits can’t do torture ya see. Never. Against the law. Hey gang. Brits have recently jailed a Brit soldier for the killing of a wounded Taliban fighter. I won’t go into it here, you can research the recent story and I hope you do. It’s an interesting one. So the Brits were witness to the questioning and the torture so he claims, and the evil Americans arrested the guy and took him to Guantanamo. After two years, he was released. And has since joined ISIS. I guess the question could be, as the left will no doubt claim. Did he turn that way due to wrong and mistaken arrest and treatment? Or was he a jihadist from the get go? Well anyway .... he got his cash if I understand this article correctly, and skipped a million bucks richer. A terror suspect given £1million compensation by Britain after he was freed from Guantanamo Bay has fled to join Islamic State. 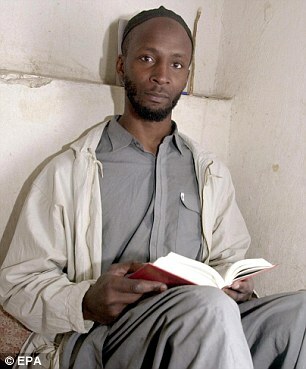 Muslim convert Jamal al-Harith was awarded the payout after being released from the US military jail in 2004. The suspected Taliban sympathiser was flown to the notorious camp in Cuba and locked up after being captured in Afghanistan by US troops in March 2002. But after intense campaigning by Tony Blair’s government, British citizen al-Harith – who had pleaded his innocence – was let out two years later. He launched a compensation claim on the grounds British agents knew or were complicit in his mistreatment and was handed up to £1million of taxpayers’ money to stay silent. But last night it emerged that, despite security services being fully aware of his previous detention, al-Harith was able to escape the UK 18 months ago to fight with IS in Syria. His journey has been revealed following an escape from IS-controlled Syria last month by British mother Shukee Begum and her five children. Channel 4 News disclosed that Miss Begum, 33, is married to al-Harith, and had flown to the war-torn country to try to persuade the fanatic to return to the UK. However, her attempts failed, and she endured a ten-month ordeal being passed between hostages and rebel groups as she tried to escape. She reached safety last month when she was rescued by Al Qaeda-linked group Al Nusra. Last night questions were raised as to how al-Harith was able to leave the UK to join IS and how his wife was able to follow him, placing doubt on the Government’s ability to effectively monitor terror suspects. It is not known if any limits were placed on al-Harith’s travel. Fresh questions were also raised about the preparations put in place by the security services ahead of the return of Shaker Aamer, the last British resident in Guantanamo. The father-of-four, 48, is set to be freed by the end of the month but his release has been delayed for at least eight years amid allegations the US is concerned about Britain’s ability to monitor terror suspects. He claimed the Taliban locked him up and accused him of being a British spy. A few months later he was found in a Taliban jail by US special forces and transferred to Guantanamo Bay. US authorities considered that he was ‘probably involved in a former terrorist attack against the US’. He was assessed as being an Al Qaeda fighter and considered a ‘high threat to the US’. When al-Harith was released in 2004, he was repatriated to England and released without charge. That year it was reported he and three other detainees launched a legal action against the US government, each demanding $10million – £5.4million at the time. Mr Aamer, whose family lives in south London, will be released after a campaign by the Mail, which argued that although he had questions to answer about his presence in Afghanistan, it was an affront to justice to detain him without charge or trial.